Giant Leap Consulting | Bill Treasurer – Courageous Leadership | Meetings, Meetings, Meetings…Yuck! Meetings, meetings and more meetings. Ever feel like you are perpetually in a state of meetings? In my consulting work, I hear this complaint a lot. You’re not alone if you feel meetings are a waste of time or that they leave you with no time to get real work done. Despite being so frustrating, meetings are important. They are where direction gets set and decisions get made. Provided, of course, that they are run well. Having facilitated productive and unproductive meetings, I’d like to share some meeting tips that, hopefully, will help you hate meetings less! Before sharing the tips, I need to make one important point: above all, make sure the meeting is a good use of everyone’s time! When people feel that having attended the meeting was worthwhile and valuable, they won’t bellyache about the meeting. DEFINE THE PURPOSE: Know exactly why you’re having the meeting, and what outcomes you want to achieve. Ask yourself, “What outcomes, if achieved, would make this meeting a win?” Write it down to remind yourself to keep on track! ADVANCE THE AGENDA: Send out an agenda, and do it at least 48 hours in advance of the meeting. Sending it out late the evening before expecting people to act on the agenda information is unacceptable, and rude. The agenda sets the tone for the meeting and allows everyone to know what the goals of the meeting are. ARRIVE EARLY: If you’re in charge of the meeting, you should arrive before anyone else does. For routine or smaller meetings, plan on being there and having at least 20 minutes to spare after you’ve set the room up. For larger and more important meetings, get there at least 60 minutes beforehand. Being late to your own meeting tells your team that the meeting is not a priority to you. If the meeting is not a priority to you, it won’t be to your team either. START ON TIME: Don’t punish the folks who arrive on time by waiting for those who don’t. Time is valuable for everyone. Consistently starting meetings on time will teach people to be on time for your meetings in the future. By the way, it has been my experience that the more senior executives you have attending the meeting, the higher the likelihood that the meeting will start late. 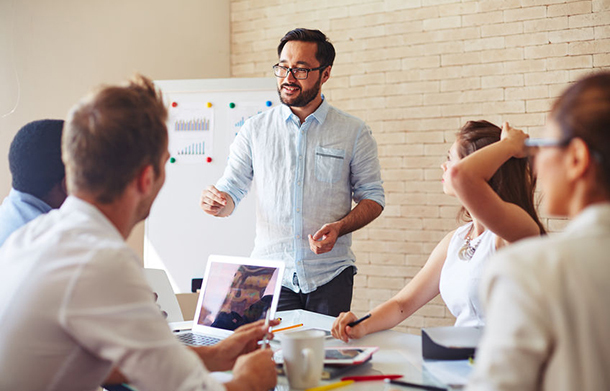 If the attendees outrank you, communicate with the most senior executive prior to the meeting, encouraging them to get to the meeting early and kick off the meeting for you. KEEP IT TIME-BOXED: Make sure to time-box each agenda item, and assign a person to be the taskmaster/timekeeper. If you run out of time on one topic, put it aside and agree to come back to it in the future. This will ensure that everything on the agenda is addressed. Put the most important agenda items upfront so they don’t become the potatoes that fall off the plate if things fall behind. END WITH A SELF-PROPELLING AGENDA: Set up the next meeting by creating the next meeting’s agenda. Reiterate what action items have been determined and who is responsible for each one. Meetings can be considered a necessary evil. However, by following these tips, your meetings will be productive and value-added rather than pointless time drains.